How to configure Virtual Server rules on D-Link gaming router such as DGL-4300? The Virtual Server feature allows access to services on your LAN from the Internet. This feature is useful for hosting onlineservices such as FTP, web, or game servers. 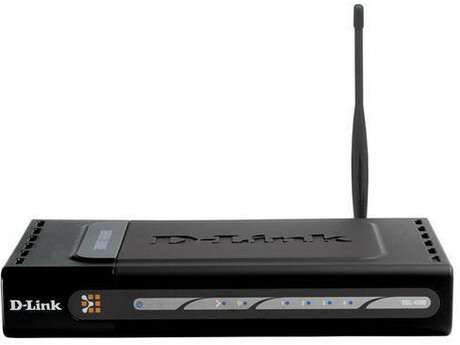 D-Link gaming router DGL-4300. Step 1. Open a web browser and type the IPaddress of the gaming router in the address bar (default is192.168.0.1). Press Enter. Step 2. The default password is blank(nothing). Click Log In. Step 3. Click Advanced at thetop and then click Virtual Server on the leftside. Enable – Check this box to enable thisrule. Name – Enter a name to identify this rule orselect a pre-defined rule using the drop-down list to theright. IP Address – Enter the LAN IP address of thecomputer that is hosting the service. Protocol – Select the protocol (TCP orUDP). Private Port – Enter the port on the LANinterface that the service is running on. Public Port – Enter the public port that willbe forwarded to the private port from the WAN interface. The publicand private port(s) are usually the same. Step 5. Click Save to applythe new settings. Step 6. Click Save Settings atthe top of the screen to save the new settings. Step 7. Click on Reboot theDevice for the new settings to take effect. How do I properly upgrade the firmware of my D-Link DGL-5500 Gaming Router? Upgrading firmware (in most cases) will reset all the settings to default which means you will lose all your settings (including your password). Unless specified, you do not have to upgrade incrementally. You can upgrade directly to the newest version. Unless the new version of firmware is only a minor upgrade, you cannot use the backup settings feature to save and apply setting to the newer firmware. Do NOT upgrade firmware from a computer with a wireless connection. Use a computer that you can connect to the router using a Ethernet cable. You may damage the router due to the increased chances of packet loss in a wireless connection environment. Step 1. Download the latest firmware. Visit http://support.dlink.com/dgl-5500/. Make sure to save the file in an easy to find location (e.g., Desktop or Download Folder). Firmware files are usually in ZiP file format and must be extracted before using its content. Step 2. Once you’ve downloaded the firmware, open a web browser (e.g., Internet Explorer, Firefox, Chrome) and enter the IP address of your router on the address bar (default: 192.168.0.1) you can also use it’s local friendly name http://dlinkrouter.local/. Step 3. Enter the username (admin) and your password (leave the password field blank of you have not setup a password yet). Click OK to gain access its web configuration pages. Step 4. Backup your configuration file. Navigate to Maintenance/System/Save Configuration Section. Click on [Save Configuration] button to download your current config file. Make sure to save the file in an easy to find location (e.g., Desktop or Download Folder). 2. Using a paper clip and holding down the RESET button, located at the bottom of the unit, for 12 seconds. Step 6. 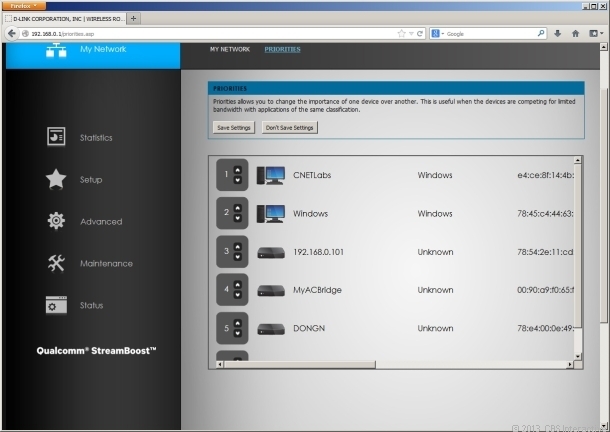 Update the router from the routers web page. To begin navigate to Maintenance/System/Upgrade Firmware and click the”browse” button find the .bin file extracted from the ZIP file you downloaded. Step 7. Click Upload. It may take up to 300 seconds for the upgrade process to complete. When the countdown timer finishes, click on the continue button. The firmware is now upgraded. Reset the unit back to factory settings one more time, by following instruction in Step 5. Step 8. After the router reset process is complete and unit is back to ready, reconfigure the router from scratch or reload the saved configuration file. Step 9. If you get a Page cannot be displayed or similar error after clicking Continue, close your browser and re-open it. Enter 192.168.0.1* and press Enter. You should now be prompted for your username (admin) and your password (leave blank)by default. Your Firmware has been updated! Note: Do not forget to enable your Antivirus and Firewall programs after the upgrade is completed. *If you have changed the local network IP address segment, resetting the unit will return the routers to it’s original LAN settings of 192.168.0.1/24. The good: The D-Link DGL-5500 Gaming Router AC1300’s StreamBoost feature that intelligently prioritizes Internet bandwidth for gaming and real-time online applications. The bad: The router lacks support for DynDNS and has a confusing interface. 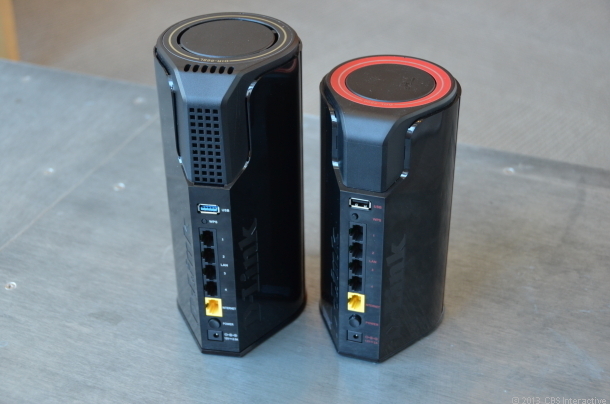 Performance is disappointing, especially compared with that of similarly priced routers. The bottom line: The DGL-5500 has a lot of potential, but for now isn’t worth its high price. The D-Link DGL-5500 Gaming Router comes in the now-familiar vertical cylindrical design, first available in the DIR-645. It’s almost exactly the same in appearance as the DIR-868L — just shorter and slightly narrower — looking somewhat like the new Mac Pro, or more like a computer speaker than a router. Unlike the DIR-868L, however, the DGL-5500 can’t be wall-mounted. This is not a big deal, however, since most of the time a router is hidden in a corner or under the desk. What is a big deal is that on the inside, the DGL-5500 is totally new. It’s the third 802.11ac (or AC for short) router from D-Link (the other two being the DIR-868L and DIR-865L) but unlike the previous two, it uses an 802.11ac chip from Qualcomm. This chip includes a feature called StreamBoost that intelligently monitors Internet traffic in real time and prioritizes the traffic based on type of application. The new router also supports only the second tier (dual-stream) setup of the 802.11ac standard, with a cap speed of just 867Mbps. Other AC routers can offer up to 1.3Gbps Wi-Fi speed. 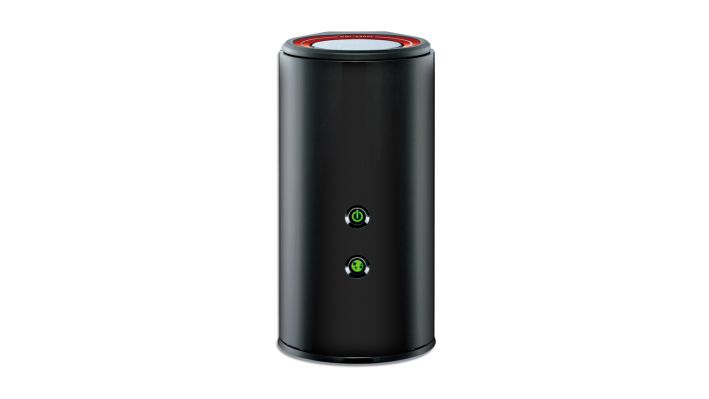 Like all AC-enabled routers, the DGL-5500 is also a true dual-band 802.11n (N for short) router that offers up to 450Mbps of each of the two 5GHz frequency bands. In short, it supports all existing Wi-Fi clients on the market, regardless of their Wi-Fi standard revisions. On the front the router has two round green LEDs that show thepower and Internet status. There are no other status lights for the network ports, which some users might miss. 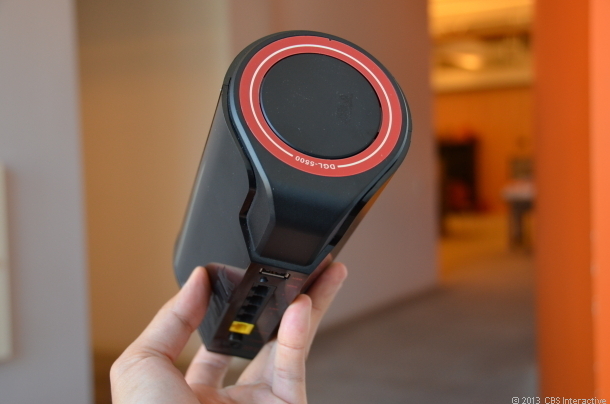 On the back, it has four gigabit LAN ports (for Ethernet-ready clients), one gigabit WAN port (to connect to an Internet source, such as a broadband modem), and a USB 3.0 port to host a USB device, such as a printer or an external hard drive. Also on the back are a power on/off button and a WPS button, which initiates a 2-minute window during which other WPS-enabled devices can enter the router’s Wi-Fi network. Setting up the DGL-5500 is typical of setting up a home router, as in this How To post. Basically, you plug the router into an outlet and connect its WAN port to an Internet source with an network cable (one is included with the router). Use another cable to connect a computer to one of the router’s LAN ports. If you don’t have a second cable, you can also use a Wi-Fi client (such as a computer or a tablet) and connect to the router’s default Wi-Fi networks. The router comes with a label with this information printed on it. Now, from the connected computer you launch a browser and you will be greeted with a Web-based setup wizard that walks you through the process in a few simple steps. You can always go back to the router’s Web interface by pointing a browser from a connected computer to its default IP address, which is 192.168.0.1. The default log-in password is blank (keep the field clear). The D-Link DGL-5500’s Web interface is updated from the traditional well-organized and granular interface of most D-Link routers. The interface is now much sleeker with smooth animation during transitions. Main items are organized in a menu to the left and sub-items are organized in different tabs on top. The main part in the middle of the interface displays the settings of the current sub-item for you to customize. It’s generally self-explanatory. As I used the router, however, I found that the interface could use a lot of improvement: major configuration items are scattered in a disjointed way and some common settings are missing. 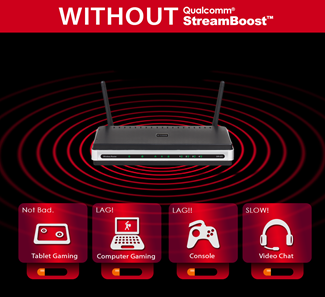 Take StreamBoost, the selling feature of the router, for example. This feature senses Internet traffic and automatically prioritizes the bandwidth, in real time, to make sure lag-sensitive applications such as online gaming and video chatting get priority while other, less important activities, such as file downloading, take a back seat. While this feature functioned well for the most part in my trials, the way it’s organized in the interface is terrible at best. First of all, to turn StreamBoost on or off, you’ll need to go to Setup in the main menu and then the StreamBoost tab. (Here you can also opt in to StreamBoost’s Automatic Update, which regularly updates information on what application needs what type of priority. Joining this is generally a good thing, however, it does mean the router will send Qualcomm information about your network.) Once on, StreamBoost prioritizes the Internet by applications as well as by clients, which you can manually adjust in an entirely different part of the interface, the Priority tab in the My Network section. This separation makes StreamBoost and the priority list seem unrelated. It would be better if StreamBoost and all of its related settings were in one place. Secondly, the priority list itself is very badly designed. Once StreamBoost is turned on, the interface arbitrarily puts all connected clients in a numeric order with No. 1 as the top priority. If you have multiple computers in a network, rearranging this list to match your desired priorities is usually a must, but unfortunately not easily. This is because you can move only one client at a time and only one step at a time. For example, if you want to move a computer from 3 to 1 you have to first move it to number 2, and then from 2 to 1. In other words, if you have 10 computers in your network and need to move the one at the bottom to the top, you will have to move it 10 times. It would be much less frustrating, especially in a large network, if you could just drag and drop the clients at will. 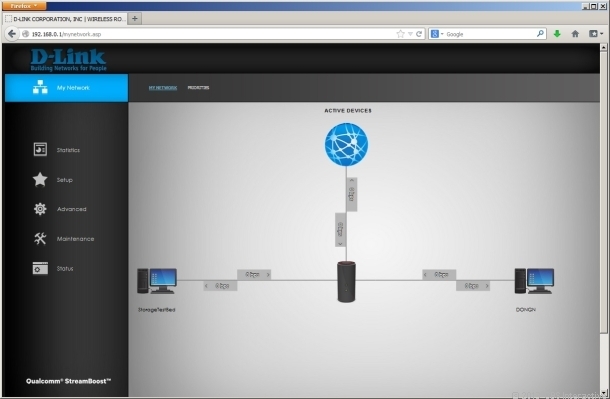 The network map reflects endpoints that are connected to the router and passing network traffic. If a device disconnects from the network, or is not passing active traffic, the device will be deleted from the Active Device network map after 15 minutes. Why are there more devices on the device priority list than the Network Map? 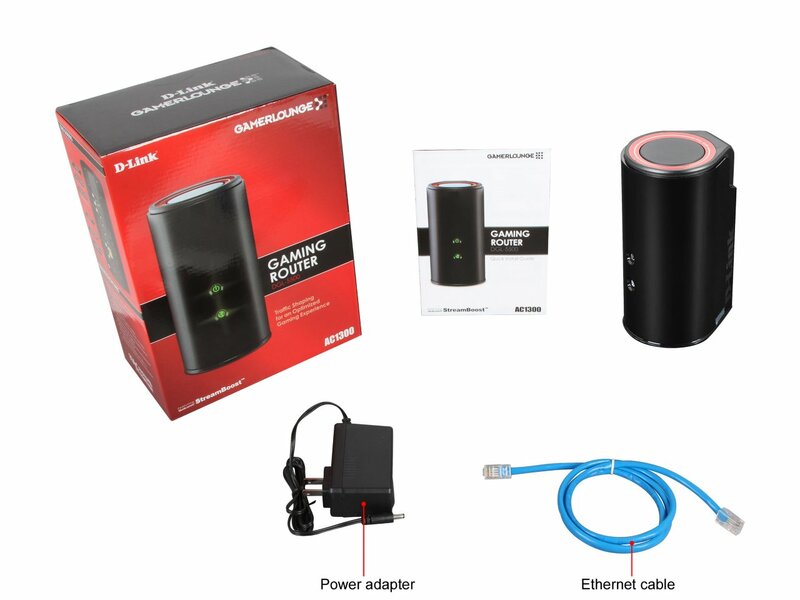 The D-Link DGL-5500 Gaming Router Priority page lists all devices that have ever connected to the router. Since people’s devices often go with them when they leave home, once a device is connected and prioritized, the intention is to persist the presence of the device to maintain its relative priority upon returning home. Can I remove devices from the device priority list? What happens when a device is given higher priority? If there are 3 devices trying to play HD video streams (protected application class) where there only is enough bandwidth to support 2 HD video streams, then the highest 2 priority devices will have their bandwidth protected to enable proper streaming performance. The lowest priority device will play, but compete with other traffic in the “best efforts” classification. The StreamBoost goal is to maximize the number of devices that can have excellent experiences with the given bandwidth, rather than a “fair share” scheme that will likely result in all associated devices having a compromised experience.If the top priority device is starting a data download (i.e. updates, media downloads), this traffic will be shaped to not interrupt the performance for streaming and/or real-time traffic on any other device. Again, the goal of StreamBoost is to guarantee an excellent experience for streaming and real-time applications. You are a gamer. A streamer. A competitor. A watcher. A consumer. You are all these things and more. Connect with something powerful enough to keep up with you. D-Link’s Gaming Router DGL-5500 features powerful traffic shaping technology that gives you real-time control over your bandwidth so that – whatever you’re into – you can do more and lag less. We’ve all experienced it: gaming, interrupted. Room mates streaming movies, family members downloading large files, significant others using Skype or Facetime — this is your bandwidth! The lifeblood of your gaming experience! Protect it while ensuring that everyone else in your home gets the best possible online experiences with D-Link’s Gaming Router with StreamBoost. QoS has been promising to solve the problem of multiple, simultaneous web users for years, without ever fully delivering. So when we got our hands on StreamBoost we were as skeptical as you likely are. Until we experienced the performance. StreamBoost isn’t QoS — it’s something much more powerful. A sophisticated Traffic Shaping engine intelligently manages bandwidth in ways traditional QoS engines can’t touch. And because it is both app-aware and device-aware, you can be confident that the indignity and inconvenience of lag has become a thing of the past. I don’t usually leave reviews on products. I couldn’t help myself this router is amazing!!! I love the form factor, the user interface, & most of all the Stream Boost Technology. My wife and I play video games on the weekends. I would experience lag every once in a while. I installed the DGL-5500 into my network. I have almost 50 devices on my network and my wife and I are the only ones using the network. I did expect it to improve my game playing experience as far as no more LAG. This router made my game playing feel really smooth, fluid and fast. When I thought it was good before when it wasn’t lagging. I was listening to other people complaining about lag and my wife and I never experience any. If you are a gamer this router is a must have. Stream Boost is like QOS on steroids. Just tried out this router to replace my Netgear router and it fixed my signal problem. My Netgear router has a poor signal strength in my bedrooms at the back of the house, but D-Link has a very good signal strength that fixed my problem. Love it! I recently got this router to replace my old one which I had for over 5 years. I wanted something good coverage since my old router wasn’t reaching the ends of my house. Set up was quick and simple and I was up in a matter of minutes. I tested out the coverage and it is amazing. Covers my entire house with no problem. My download speeds improved from immensely. Overall the router is great for my needs and I couldn’t be happier.